It can be a challenge to buy a gift for your brainy, science-obsessed friend. What kind of games might he or she like? The science brains among us can be so intimidating, partly because it's always scary buying things for smart people, but partly because who knows what those science people even like? Do they want beakers? A scale perhaps? Maybe some sort of assistance in covering up their secret meth-cooking operation? This list is for you, weary gift-giver. It's here to help you find some fun science-ish gifts for the egghead in your life. And always remember: if none of these sound good, you can always tell them that your gift-selection process is "still in the hypothesis stage." Scientists love that kind of stuff. One of the smartest games in recent memory, Spacechem and science go together like peas and carrots. I mean come on, it's called "SpaceChem!" And it lives up to that name. It's an ever-more complex game that involves creatively coming up with combinations of molecules to form new chemicals. It's open-ended, hugely brainy, and rewards lateral thought and creativity. While we're talking about things that smart people like, Tom Bissell's 2010 book Extra Lives: While Video Games Matter, while not particularly sciency, remains one of the most purely enjoyable pieces of video game writing you can buy. Think of it as a more holistic alternative to Jesse Schell's book (later)—well-written, humorous stories about games and the people who make them. Since it's a safe bet that your friend will already have played Valve's smart and sciency Portal 2, what better way to celebrate both their love of games and their love of Portal than with a fun Portal T-shirt? This one, from ThinkGeek.com, seems particularly appropriate. One of the best things about Portal T-shirts is that they hold up even if the person viewing the shirt doesn't get the reference. There's science to do! Fate of the World is a game that cries out for a scientific mind. A complicated and unforgiving simulation about global climate change and strife, it requires players to carefully navigate a minefield of potential disasters while working towards some sort of accord. Which usually never comes. A knowledge of world economic, political, and environmental affairs is required, and even the most seasoned leader will learn something after a few games. It's not easy, and it's not forgiving, but science never is. One of the smartest and most accessible game-design books out there, Jesse Schell's The Art of Game Design: A Book of Lenses strikes a great balance by being both hugely informative about the process of making games while not shutting out readers who may not know a ton about the nuts and bolts of game design. Schell himself—former Disney imagineer, professor at Carnegie Mellon, all around cool dude—is the main attraction here, and his inviting style makes for a tremendously enjoyable and educational read. When buying games and gifts for a person who loves science, it's important not to forget the most science-tastic game of all, Portal 2. While it's likely that most science fans have already played the game, it's worth making sure, since Portal 2 was easily one of the smartest and most enjoyable games of 2011. The puzzles are first-rate and make you to really use your brain, and the story is hilarious—you'll never look at robots (or potatoes) the same way again. I suspect that some people will be building molecular computers, but that certainly doesn’t mean that’s the only thing we’re looking for. So, they’ll be building molecular computers, will they? If I load this up there’s a very real chance that it’s the last anyone will hear from me until I’m found with my entire face clenched into four square inches of pure concentration as new elements spew catastrophically from my motherboard. * Added a "sandbox" puzzle type to ResearchNet to facilitate "experimental" pipelines, such as molecular computers. * Added Japanese and Italian translations. * Fixed several errors in the Russian translation. * "Quick alt-tab" fullscreen now properly hides the menu bar and dock on Mac OS X. * Fixed a bug where erroneous zero scores were sometimes uploaded to Steam leaderboards. * Fixed a bug where control-dragging atoms in molecule editors wouldn't copy them on Mac OS X.
Hopefully this is happier indie price-experimentation news than the below… What began as really little more than pay what you want for one game – that being Frozen Synapse – has been slowly expanding to be some> games, as appears to be Humble Bundle trends. You’ll be very glad to hear that the very, very good Space Chem is the latest addition, joining Trauma which was bundled in earlier this week. And yes, this works retroactively for people who already bought the FZ bundle. So, whatever you have given or are prepared to give, you’ll end up with FZ, SpaceChem and Trauma – and if you beat the average price you also get a package of Frozenbyte games to boot. All the games are available in PC, cultist PC and hippy PC flavours, by the way. If you don’t know what Space Chem is, then boo. BOOOOOO. And also read this. A friend who was recently planning his amusement for a 14-hour flight asked me for a game recommendation. You will only need one game for the entire flight, I told him. Shortly afterward we sat down. I produced my iPad and proof. The proof is called SpaceChem. SpaceChem must be recommended with warnings. It is a game about chemistry sexed up with the short skirt of assembly line management. I told my friend he would enjoy SpaceChem if he didn't mind feeling nerdy. My friend will also have to enjoy feeling like the architect and foreman of an auto plant. This is a puzzle game based on partially fake science. Each SpaceChem mission requires the player to produce molecules from atoms. The atoms and molecules are accurate. The game even includes the Periodic Table for reference. The means of constructing these small particles is not. 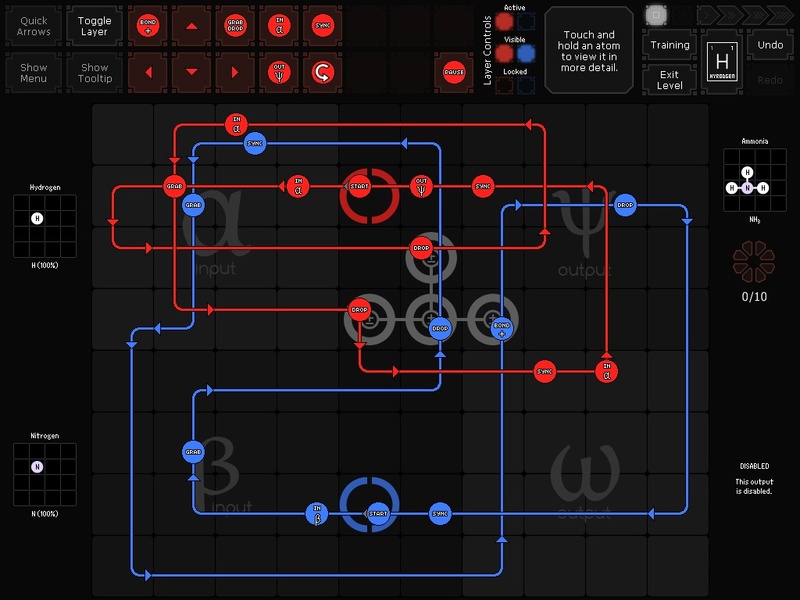 The SpaceChem player is given grids, some assembly line track to draw through those grids and a batch of commands to place along those paths. With that, you will assemble molecules. Let's say a level of the game tasks you to create water, H2O. You will draw and program one line so that it summons and snatches a hydrogen atom, places it on the left of three adjacent bonding circles and then does that again, but puts the second hydrogen on the circle on the right. Before setting your hydrogen conveyer in action, you will draw and program another line to drag an oxygen between the hydrogens, activate the bonding circles to forge the H2O molecule and ferry it to an output area. Since you will need to make 10 water molecules, the two assembly lines will need to loop and not fall so out of sync that they start outputting HO instead. They probably will, so it is good that the game allows the lines to be halted so you can redraw or reprogram them. You believe me now? Nerdy. Assembly Line... Not work. Fun. Levels in this game last a long time, because your brain will be taxed trying to figure out the proper process, moreso when the game zooms out and requires you to assemble multiple molecules in multiple reactors en route to forging one final molecule (as seen in the screenshot atop this post). The game's long play sessions will keep my friend occupied on his flight, but so will the problematic touch controls, less cheerfully. SpaceChem was originally made for computers, where it's been available for months (we've called that version "frightening" and "addictive"). With a mouse, the precision required for laying all these assembly line tracks and commands is no problem, but even on the big screen of an iPad, the human finger is too fat to easily tweak a complex part of SpaceChem assembly line. Laying the line out is fine, but once you need to press on certain parts of a spaghetti of track, you've got yourselves a molecule of a problem. My friend will spend part of his flight wishing he could see through his fingers, I am sure of it. The solution would seem to be to magnify portions of the screen with a touch, but that's not in there. The fat-finger limitations of the touch control do not ruin the game, but they add unnecessary frustration to a game that already points out to you on its menu screen that there is a more robust version of the game available for computers. (The iPad version lacks the computer version's bosses and some other features it's ok to live without.) Surely this game controls best with a mouse or would with a stylus. I expect my friend to have a good flight, as long as he's taking off on or after October 1, the day SpaceChem for iPad becomes available (for $5.99). Touch issues notwithstanding, the game is a nerdy wonder. It's a stellar puzzle game well worth your time and brain cells. •	Added custom production puzzles to ResearchNet. •	Added translations for Spanish, French, German, Russian, and Portuguese, accessible through the in-game options menu. 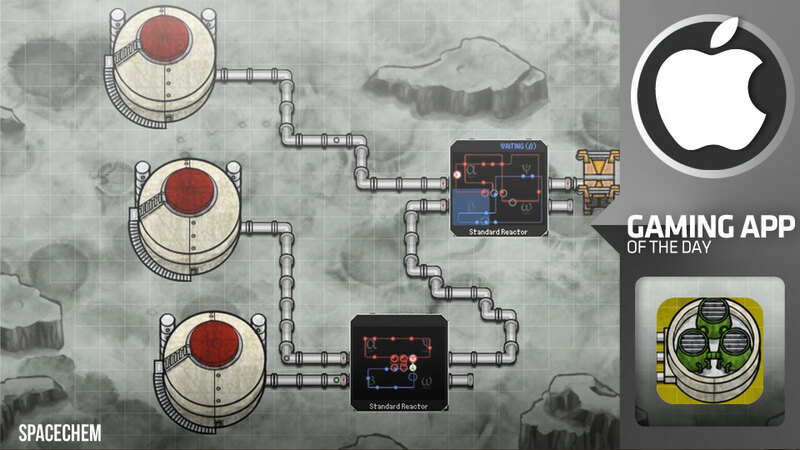 For my money, überpuzzler SpaceChem is still the best indie game we’ve seen in 2011. You can read Wot I Think here, but don’t just take my word for it- even renowned X-Men author Kieron Gillen said that it’d been a long time since he’d played something “so obviously genius”. As of this weekend, developer Zachtronics has just upended another frothing beaker of content into the deadly vat of entertainment that is SpaceChem. By which I mean they’ve updated it. I’m talking Team Fortress 2 tie-in items, I’m talking 12 new levels, I’m even talking about a new level editor and inbuilt sharing options to make sure there’ll always be some hateful new puzzle that will paralyse your mind like a King Cobra. Details after the jump. As long as we’re talking superfine indie games, SpaceChem, the finest puzzle game 2011′s seen to date (and arguably the finest indie game, too) has arrived on Steam. Anyone who hasn’t yet tried the demo (available in Windows, Mac and Linux flavours) should physically drop what they’re doing to do so immediately. Yes, even if it’s tea. I don’t care if it’s tea and you’re drinking it directly above your child. What’s your child doing there! Download this demo!